SkySurf.travel (http://skysurf.travel) is not just for booking cheap round-the-world air tickets. You can also find cheap one-way or round-trip airfare deals, or customize your trip anyway that you desire. For this blog entry, I’ll be giving you an example of how you can travel around a few countries in Europe for mega-cheap from NYC. If you already live in Europe, it’ll be even cheaper. Let’s say I want to visit Europe for two months, visit a country each week, and then return back home to New York City. I enter in NYC in the “Traveling from” field and September 1st as my departure date. I select the “Multi-city” option and click on the “Search Best Deals!” button. The cheapest flight to Europe on September 1st is $306 to Naples, Italy. I’m pretty flexible with dates, and would like to see if there are any cheaper flights to Europe in September, so I click on the “Find the best deals for September 2016” link. I find a flight to Oslo, Norway for $181 on September 29. I add this flight to my BookIt list. A popup appears, such as the screenshot above. 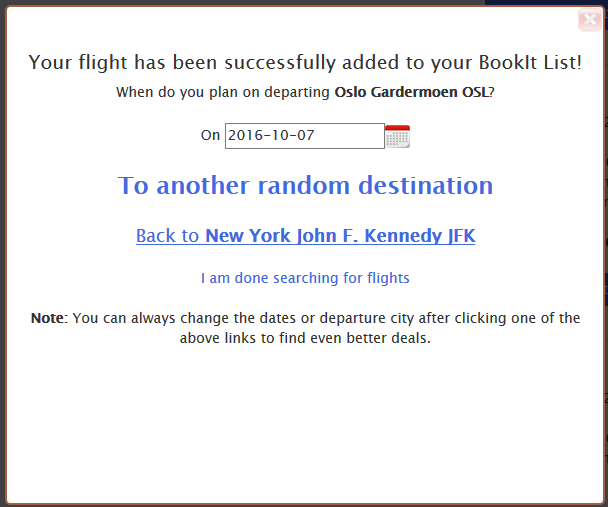 I am going to spend a week in each country, so I select October 7 as my departure date and then click on the “To another random destination” link. The cheapest flight on October 7th is to Germany for $41. I add this flight to my BookIt list and repeat the process above until I’m ready to add my return trip flight back home to New York City to my BookIt list. Please note that some airlines may charge an additional fee for baggage. Usually carry-on luggage is included free of charge. If you want to fly cheap, packing light is a good idea. That’s a total of 8 countries in 2 months for $567.17; all non-stop flights. According to this Business Insider article (http://www.businessinsider.com/10-cheapest-flights-from-nyc-to-europe-2014-9), the cheapest round-trip flight to Europe from New York City, on average, is to Oslo, Norway for $552. So instead of just visiting Oslo, Norway, I’m visiting 8 countries for about the same price! It’s as if I’m getting free trips to other countries by using the online service SkySurf.travel. Here are some tips on getting the cheapest airline deals for when flying to or from Europe. Try to fly into or out of these countries for the cheapest deals: Norway, Sweden, Denmark, Italy, France, Iceland, Russia, Ireland, or the United Kingdom. Norwegian airlines are usually the cheapest and they fly to Norway, Sweden, Denmark, Ireland, United Kingdom, and France non-stop. Let’s say I were to live in Germany and did not need a return flight trip back to New York City. I would be paying about $175 for flying to 8 countries around Europe for 2 months. Not a bad deal!